wish to know if any spark of this consuming fire burns in you, then fly in haste to Naples and hear the masterpieces of Leo, Durante, Jomelli and Pergolesi.“ (Jean-Jacques Rosseau, 1767). 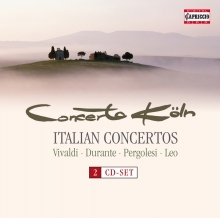 Beside some matserpieces of Antonio Vivaldi, these 2CD-Set includes rarities of neapolitanian composers, like Francesco Durante or Leonardo Leo. 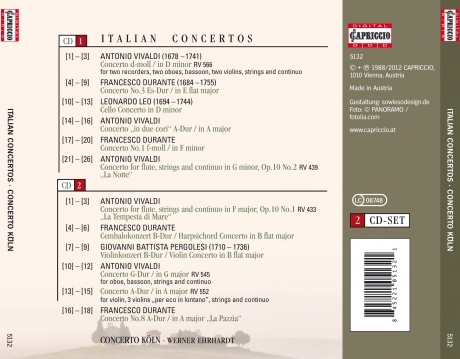 Compositions rediscovered and recorded by the musicians of CONCERTO KÖLN with worldwide appreciation and honour.